At this time of year my go-to breakfast is porridge, usually with a honey and a sprinkling of seeds on top. But when I fancy a change I like to make up a big batch of whoesome Bircher Muesli. There are lots of variations of Bircher, some made with milk, some with juice and some just with yogurt. I prefer to use a combination of juice and then add some yogurt in at the end – I found fruit yogurt works especially well, and you can pretty much use whatever flavour you like best. The best part of the this recipe is that you can make it the night before and leave the oats & liquid to work their magic overnight. The next day all you need to do is chose you toppings and you have a deliciously satisfying breakfast – and less prep on the days means more time in bed! I’m especially chuffed that this recipe featured in the Simple Things magazine a few months ago. Ready for some autumnal breakfast loveliness? Ok, here you go! 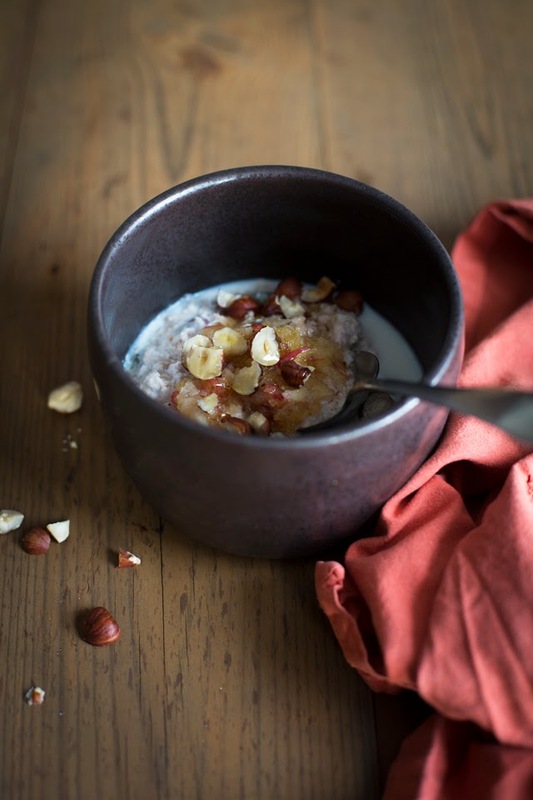 Put the porridge oats, chopped nuts, raisins and seeds in a large tupperware container, pour over the apple juice and mix all the ingredients together. Seal the container and refrigerate overnight. The next day, stir in the yogurt and spoon into serving bowls. Top with grated apple, roughly chopped hazelnuts and a drizzle of honey to taste.